The government received yet another record-breaking volume of Freedom of Information Act requests last year, but a handful of agencies, year after year, continue to receive the majority of those requests. A study featured Wednesday at a meeting of the FOIA Advisory Committee at the National Archives and Records Administration shows that for every FOIA officer, there are about 188 FOIA requests. That ratio between workforce and workload, said Tina Nabatchi, an associate professor for public administration and international affairs at Syracuse University, appears difficult to manage. “There really still appears to be this imbalance in the total number of full-time staff and the number of cases,” Nabatchi said, one of the authors of a report published last year on trends in FOIA administration. The study analyzes aggregate FOIA.gov data from 102 agencies between 2008 and 2016. Bradley White, a FOIA officer for DHS’s Office for Civil Rights and Civil Liberties (CRCL), said that staff-to-request ratio seemed lower than what he’s experienced. White previously worked for seven years at the Immigration and Customs Enforcement’s FOIA office. During that time, he said each agency analyst had a weekly quota of processing 35-to-50 FOIA requests a week. “That ratio probably fluctuates tremendously depending on where you are,” Nabatchi said. Khaldoun AbouAssi, an assistant professor of public administration and policy at American University, and the study’s second author, noted that even the most well-staffed agencies struggle with FOIA backlogs. “We’re seeing that the more staff or the more employees, the higher the number of the FOIA backlog,” AbouAssi said, adding the results of the study would require future investigation. 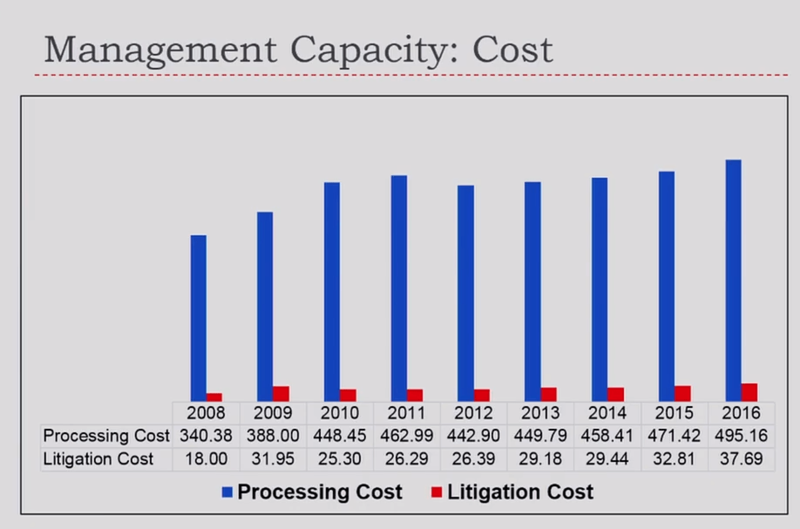 Over time, the cost of processing FOIA requests has also increased. In 2016, agencies spent nearly half a billion dollars processing FOIA requests. However, Nabatchi added that collected fees for FOIA covered less than 1 percent of total costs. Agencies that receive the most FOIA requests, Nabatchi noted, fall into one of two buckets: agencies that process individual benefits for claims, or agencies with a law enforcement or national security mission. Five of those agencies — VA, HHS, DOJ, DHS and DoD — and the Agriculture Department employ more than 65 percent of governmentwide FOIA staff, Nabatchi said. However, Emily Creighton, the deputy legal director at the American Immigration Council, and a member of the governmentwide FOIA Advisory Committee, said a “large number” of FOIA requests at DHS come from people submitting individual files requests to U.S. Customs and Immigration Services for their immigration records. “That really just has to do with just how the immigration system works, and that’s how they access their data. That is the only way that they can access their records,” Creighton said. Nabatchi said she and AbouAssi debated whether to break out the FOIA data on agency components, but ultimately chose not to. “Do we look at the agency as a whole … or do we start looking at the units within the agencies, because there’s going to be variation within those units as well,” she said. Alina Semo, the director of the Office of Government Information Services at NARA, said in an interview last week that professionals are often “overlooked” and not given the credit as they deserve fulfilling a difficult but important job. In 2012, the Office of Personnel Management introduced a government information job series aimed at giving FOIA professionals more of a career path. Since then, Semo said she’s generally seen a more positive attitude among FOIA professionals, but added that the future of the workforce remains a concern. “I worry about the fact that we’re not going to have another wave of FOIA professionals that will come behind the ones that are going to retire in 10, 15, 20 years,” she said. The FOIA Improvement Act, which Congress passed in 2016, requires agencies to post documents online after they’ve been requested three or more times. But one of the major bottlenecks of that law is the time it takes to code released documents to make them accessible to online users with physical disabilities. In many cases, FOIA officials end up doing the Section 508 coding, but that takes time away from processing more FOIA requests. “What we hear from agencies is that the IT shops don’t necessarily want to help because they have their own to-do lists that don’t include making documents Section 508 accessible, and usually it falls back to the FOIA professionals to do it,” Semo said. As part of its request to Congress, OGIS has suggested reaching out to the General Services Administration’s 18F agency to streamline and simplify the process of making documents 508 compliant. Likewise, OGIS said the Department of Health and Human Services’ National Institute on Disability, Independent Living and Rehabilitation Research could help automate Section 508 processing. A third, but less likely scenario, Semo said, would have agencies proactively post an “index” of records released under FOIA.